Since everyone is giving you such a good rap, I was wondering if you have basic setup information for a 355CH. No one in Australia knows a damn thing about them, and I’d LOVE to have a basic starting point for spring rates, ride height and suspension settings. It’s a pre wing model, and is used on the road as well. Any help would be very appreciated…I’ve been trying to get to the bottom of this for years! It doesn’t handle badly, as such, but it would be good to know that it’s in the ballpark. I need additional information on your set-up, experiences, and expectations. Is there a benchmark you’re shooting for (lap time or specific car you want to out handle on the track)? What’s your own personal driving CV? What are your current ride heights, toe, camber, and castor? What tires and pressures? Do you have tire temperature data? How much street driving as a percent of time or mileage? How important is street comfort and street tire wear? Is your chassis a factory built car or conversion? What year chassis? Do you know if all updates have been installed and do you have the spare optional springs, set of suspension packers, anti-roll bars, oil cooler update? 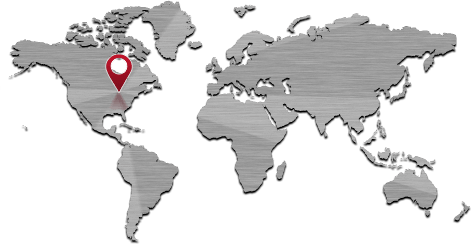 All of this information helps me with recommendations tailored to you and your car. I can supply a baseline, but it assumes all existing Challenge equipment and Pirelli slicks, which may be different from what you have. Finally, the chassis can be tuned to the driver’s preferences to a certain extent. Well, I’ll try and answer these questions as best I can…I’m not that mechanically minded. Driving wise, I just go to club days. I usually win outright unless there’s a much faster car there, and sometimes even then. I started in 1985 when I bought my 3rd Ferrari and have done plenty of practice and courses over the years. I’m not a great driver, but most of the others are much worse. I use the car mainly on the road and track it 4 or 5 times a year. Current ride height is 160mm rear and 135mm front at the lower suspension arm bolt. I usually use Hoosiers on the track and aim for about 40psi hot, which is generally the accepted figure. Comfort and tire wear is not of PRIMARY concern, but nevertheless the car will always have to be a compromise…I realize that. It’s a factory challenge. 1996 and hasn’t had any of the 1998 upgrades. be an abomination considering what the 1800lb was like! I have no suspension packers. Baseline recommendation is all I’m looking for. I realize that different conditions, tires, driving styles etc ALL make a difference, but I’d LOVE to know that I’m in the ballpark, as I said, and would be happy enough with that. Shockers are another issue, but I don’t now HOW we’d ever get around that subject, unless there’s a simple bump and rebound “number” or something. I understand your reasons for compromise. The set up I’d recommend won’t be suitable for your comfort. I run the ride height as low as practicable, 90 mm front, 95 mm rear, typically, measured from the bottom of the chassis, just behind the front wheel centerline, and just ahead of the rear wheel centerline, not including the undertray. Go as low as possible, and balance high-speed turn in and stability via chassis rake adjustments. You can vary rake at either the front or rear. Keeping the front as low as possible gives best aero, keeping the rear as low as possible aids in rear stability in medium and high speed corners. Most important is the highest speed corner and sacrifice the slowest (even if it leads to a long straight). More rake improves turn in, but tends to destabilize (makes the car feel nervous) at higher speeds. Some guys prefer to “kill” the front by raising it to balance the chassis and give more stability. Increasing rear toe-in will get the rear back under control, I’ve run as much as 45 minutes of total toe-in. Toe in or out at the front is up to you, but usually no more than 10 minutes either way total. Out promotes turn-initiation, but may ‘bird-dog’ or increase high-speed straight-line directional instability, which novice drivers may find disconcerting. Typically, I always ran the big front springs, the updated larger front ARB, larger rear ARB, and the 700 lb/in rear springs. I manually locked the rear dampers full stiff (CCW) and estimated the front at 15 degrees off full stiff. The adjuster only rotates 90o from full soft clockwise to full stiff CCW, so the adjustment is very sensitive. You must secure these settings or the damper fluid tends to push the adjuster to full soft (CW). I used RTV gasket silicone because I had time to let it set up. The idea with the 355 Challenge is to lower the chassis as much as possible which benefits aero and CG, add camber appropriate for the tires, and offset the increased camber gain by reducing roll via the stiff (2200 lb/in) springs and adjusting the packers. On a smooth track, you end up riding the bump rubbers in high ‘g’ corners. When done properly, the car is sensitive to 1mm change in packers and 2 psi tire pressure changes with Pirelli slicks. The fastest drivers ran the wing at zero, or +2 at a slow track. Remember to compensate wing angle for rake changes. Changing ride height changes camber and toe, though I’d always do quick changes in ride height during practice and then just reset and verify all settings in the evening to save valuable track time. Corner weighting is mandatory here too. Running the soft front springs, as you have found, increases road comfort, but you’re losing ultimate grip and balance here. As you said, set up is always a compromise. The Hoosiers are a great DOT race tire. Do you take pyrometer readings, three per tire, outside, center and inside? If not, this is the best way to determine camber. Sounds like your pressures are in the right range. If you don’t do temperatures, you can default to judging tire wear and feel from your a**-o-meter. Trying a set of slicks will drop lap times 3 to 6 seconds per lap at a twisty 2 mile track, driver skill dependent. wow…that is really incredible information. Thank you so much. Now I’m going to go out and play with it. I finally understand why they supply those HUGE front springs. I’m going to have to try this. I’m not sure that I’ll be able to lower is quite as much as you’ve recommended as I drive it to the track and might not get out of my driveway. I’ll also have to check and see what size roll bars I have. I know they’re bigger than the road car, but I’m pretty sure they’re not the ones you’re referring to. Do you have diameters of them, by any chance? Search the Fchat archives for 355 Challenge information, I’ve posted quite a bit, including ARB sizes and equivalent wheel rates. street cars. If you find an original Challenge manual, it will show the differences between the factory Challenge and “how to” convert a normal road car. All factory Challenge have structural reinforcements to the front suspension, the spring rate in front is 2200 lb/in, the normal road cars require removal of the upper spring/shock mount and welding in a beefier component. I believe there may only be a couple documented truly converted from normal street production 1995 Challenge in the USA. BTW, the 1995 Challenge came with the AC compressor, hoses and condenser in a box, not installed. There are no 1996 Factory Challenge in the US as the 1995’s did not all sell until 1996. I managed the last 1995 sold, a red/tan, originally campaigned by Tom Murphy in Challenge, then in SCCA T1 (Runoffs podium in 1998), then sold to a gentleman on the west coast and converted back to Challenge roll cage. The front and rear bumper covers are Kevlar, not carbon fiber, though carbon ones were/are available, though technically were illegal for Challenge. The undertrays are fiberglass originally, which is good because they are torn up with an agricultural excursion. There is an upgrade to the oil cooling system in 1997. It eliminates the oil-to-water heat exchanger and uses a conventional oil-to-air heat exchanger. Before the authorized kit was released, teams could fabricate their own version, though it was to be replaced in ’97 to remain legal. Manual control of cooling fans is standard and recommend you run at all times on track. They also remain thermostatically controlled. There is an upgrade to the ABS ECU in 1998, very important. Upgrade to quick ratio steering and pump matched to this rack. Larger front ARB, too. This was part of one large update kit mandatory for 1997 that included the wing. Brake rotors are available from any Brembo dealer, I recommend running slotted only, not drilled, unless rules prohibit otherwise. I have run Performance Friction and Pagid pads. I like the PFC’s best, but this is more driver preference for pedal feel than outright performance improvement. The Pagid R4-2 (blue) is the OEM Challenge pad. 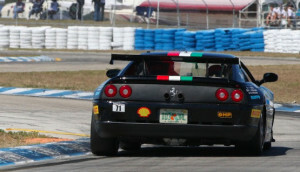 In the US, SCCA homologated the complete Challenge specification with the exception of tires. They may have adjusted the weight, though I ran the Challenge weight in 1998. This was a front and rear upgrade. The old front bar is approx 0.875 inch diameter, 35″ length, 7″ arm, 0.5 motion ratio, yielding a WHEEL RATE (the only spec that really matters) of 96.5 lb/in. The old rear bar is 0.669″ diameter, 39″ long, 7.75″ arm length, 0.6 motion ratio, yielding a wheel rate of 35 lb/in. New front bar is 0.945 inch diameter, wheel rate of 131 lb/in. New rear bar is 0.748 inch diameter, wheel rate of 54 lb/in. The 0.945 front bar is the only way to go, the car needs front roll stiffness. 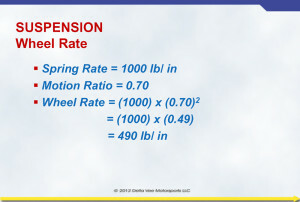 Wheel rates with the big front spring and soft rear (2200 and 700 lb/in, respectively) is 1078 lb/in front and 506 lb/in rear. 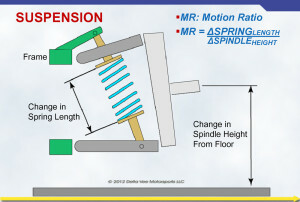 So, you see that relative to wheel rate of the springs, front bar does contribute some, rear bar relatively much less. To put all these numbers into perspective, the stock wheel rates on a 308 series are around 100 lb/in. comparatively very soft. 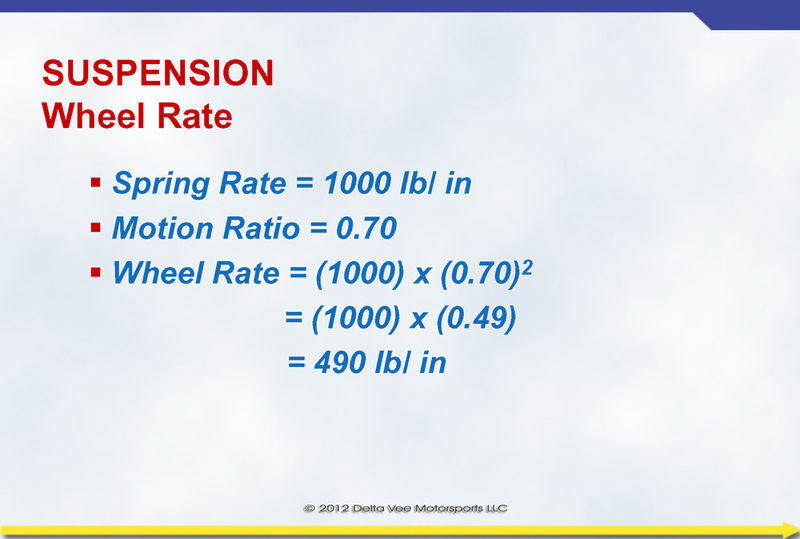 The difference between wheel rate and spring rate is the wheel rate (also in lb/in) is what the driver feels and the tires deal with while driving. Wheel rate takes the geometry of the suspension into the equation and makes it easy to compare different cars. A better comparison is ride frequency, but I’ll present one thing at a time. Motion ratio is simple to find. Jack the spindle up one inch and measure how far the lower spring perch has moved relative to the upper spring perch. On a 348 rear suspension, the spring perch will move an average of 0.85 inches for every one inch the wheel moves. So, the motion ratio for 348 rear is 0.85 (you may see equations that use the inverse of this number, Carroll Smith’s equations would come up with 1.18 for the ratio). With this knowledge, one discovers that many Ferrari’s are designed with wheel rates as low as 100 LBf/in, which is the TR rear double shock suspension. So your 200 LBf/in spring in the 308 drops with the motion ratio to 98 LBf/in. approximately. The equation is WR = SR(MR)2,WR is wheel rate in LBf/in, SR is the spring constant in LBf/in, and MR is motion ratio where MR is stated as Dshock position Dwheel position. Why are Ferrari’s so “soft”? This term is relative, IMO, Ferrari’s are no softer than most other road going cars, even other sporting automobiles. Suspension design is all about compromise with a road car. The environments change, the market is world wide. Ferrari determined that this is the best solution, and I agree. Most Ferrari’s are comfortable, even on long drives (and I’ve driven them cross-country), and sporting enough to be better in many ways than the competition. Ferrari improves on the average sporting car with a bit more suspension damping. As an owner, overall you are satisfied. But this compromise in design opens the door for improvements if you (the owner/driver) have interests outside Ferrari’s average design parameters, like track events or actual competition on the racetrack. For reference, the front wheel rate of a F355 Challenge car is 1,078 LBf/in with a 2200 LBf/in spring! This is very uncomfortable on the street, plus this system utilizes a tender spring to take up slack when the suspension goes full droop, and comes crashing down on this tender spring with every slight roadway undulation. Please email me right here. Next Post What is Critical Damping of Shock Absorbers?